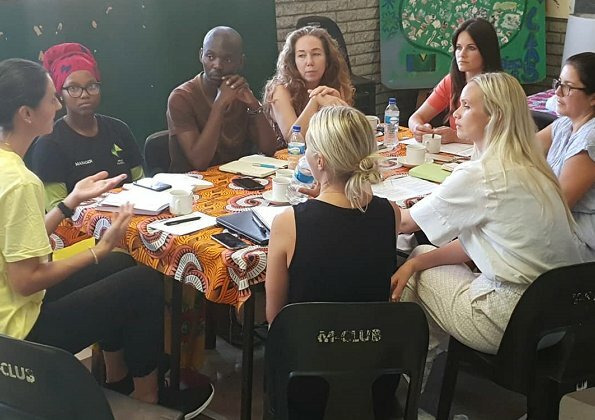 Swedish Princess Sofia visited South Africa this week to work with the team of Project Playground. Relating to that visit, The Princess shared a few photos on her official Instagram account. Princess Sofia is a founder of the non-profit organization Project Playground. The objective of that organization is to improve the life opportunities of children and young people by means of organized activities, sports and social activities with a focus on the individual. Busy Pss. Lovely top and smile. Fake work. She did not start the Project Playground. Her friend Frieda did. ATL you literally comment only whenever you have something bad to say about Sofia. ATL is actually right. Frida already admitted in 2011 that she founded PP in 2009 not Sofia and Her in 2010. The interview was eliminated online after the engagement was announced. Anyway... He/she was the right to their opinion, negative or positive. As long as no one is insulted of course. On the Project Playground website, it says that Frida and Sofia met in 2009. And started the charity in 2010. I would go by the website here. Most people would. Information on the Internet is always open for debate. Just because it is there, doesn't mean it is correct. And if it was taken down, I would say that would be the first clue that something may not have been right there. nice pic of Sofia! Love the outfit. I believe she and Frieda co-founded project playground didn’t they? Yes they did! According to the Project Playground website, they met in 2009 and founded it in 2010. I don’t know whether she started it or not, but her work with them isn’t fake. Her mother in law, Queen Silvia, made a visit with project playground when she was just in South Africa. Nice way to honor her daughter in law. Queen Sílvia's purpose was to visit the work of childhood in SA. She of course visited PP has well. The royal court only posted info on childhood visit but I believe PP took some photos of the queen visiting PP. You have to go to the official calendar on the website and click into the visit. Project Playground, founded by Frieda and Princess Sofia, is listed as being one of the charities the Queen visited. The Queen will always be associated with Childhood. But she did visit Project Playground, which like it or not, is always going to be associated with Princess Sofia. And I think the Swedish Royal Family is fine with that. They can compliment each other and help each other. Nothing wrong with that. I am sure that Frieda was tickled pink to have the Queen visit. It can only help Project Playground. Which of course is the most important thing. ATL, fake work? Do not eat so much lemons. What have you done for improving childrens life in the world? And yes, she started the project with Frida. I will keep comments to fashion. Sofia's outfit is just meh for me. But since this visit seemed to be more about the project, perhaps that, not clothes, was more her focus. Well said. I don’t think this was an event that was publicized a lot. Looks like just a comfortable working outfit. We don’t know how long she has been there or what has been going on. Good for her. But you wrote it in every case😉🤣.